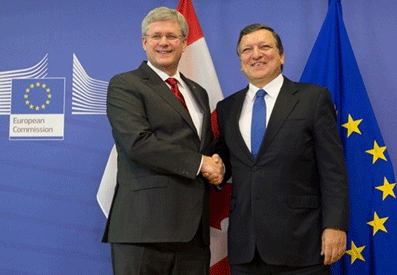 Manuel Barroso announced an agreement in principle on CETA last October. Canadian Prime Minister Stephen Harper hailed the Canada-European Union trade agreement as an historic opportunity for Canada even though the deal has yet to be finalized. Canadian Prime Minister Stephen Harper and EU President Jose Manuel Barroso announced a Canada-European Free Trade Agreement in October at a joint press conference in Brussels. The final details are to be released September 25th, 2014. The Comprehensive Economic and Trade Agreement, CETA, is the most important trade accord since the North American Free Trade Agreement. It is designed to eliminate thousands of tariffs, encourage foreign investment and promote movement of labour. Once implemented, 98 per cent of EU and Canadian tariffs will be eliminated immediately. Other tariffs and restrictions will be phased out over seven years. The EU is Canada’s second-biggest trading partner. In 2012, Canada’s trade with the EU totalled $89.2 billion, comprising $38.7 billion in Canadian exports to, and $50.5 billion in imports from, the EU. According to an EU analysis of the agreement, European Union exporters will save more than $670 million annually in duty payments. Mr. Harper says: “The agreement as it now stands is not going to change,” he said. “I am certainly confident of its adoption in Canada." Forty-four percent of the total number of containers handled at the Port of Montreal already go to or come from Northern European markets located within the EU. Among the port’s advantages, ocean transit time between Montreal and Europe is only eight days. In North America, the port provides access to 40 million consumers within one trucking day and another 70 million consumers within two rail days.